The House of Jones: WOW...this is my 103rd post! WOW...this is my 103rd post! I just happened to notice that I have posted 102 times before this post. I didn't even realize I was close to 100, let alone over 100! Just wanted to share with you a few pieces of artwork that each of the girls did. This first piece was drawn by Rebekah. She said this is her family. I asked her who each person was and this is what she said, in order from left to right, "Don't know, me, Nana is yellow, Daddy, Mommy and Sissy." Precious! Rachel drew this second piece of artwork at school. They were studying about all the American symbols. 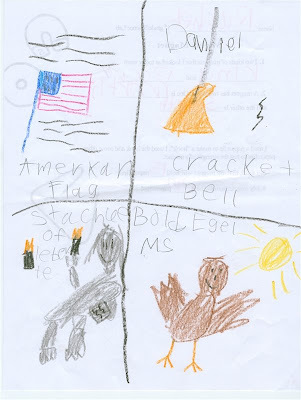 You can see that she drew the American Flag, the Liberty Bell, the Statue of Liberty and a bald eagle. Again, very precious. Hope you enjoyed! Stay tuned...new house tour coming soon!